The members of the Versailles FFA outdoor power team placed second at the district contest and will advance to the state. Members included (l-r) Sam Gilmore, Dallas Hess an Isaac Gilmore. 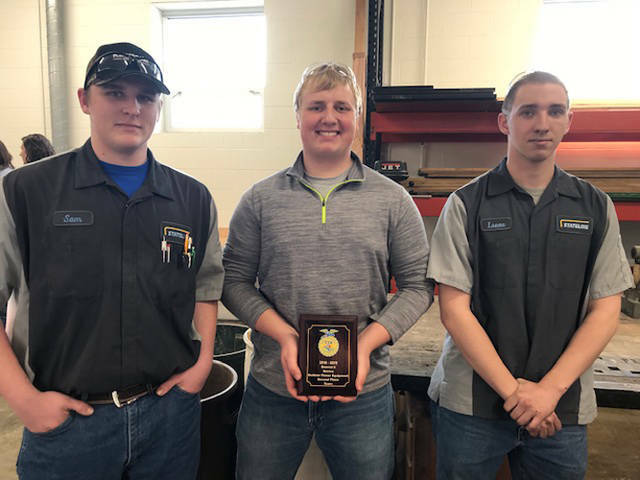 MINSTER – Versailles FFA’s outdoor power team competed in the District 5 FFA Outdoor Power Contest on April 9 at Minster High School where Versailles placed second in the district out of 12 teams. Contestants participated in trouble shooting as an individual and team, completing work order, determining engines displacement, tool and faster identification, measuring through micrometers, and test focusing on small engines. The team consisted of Isaac Gilmore, Sam Gilmore and Dallas Hess. The Versailles FFA thanked Flora Small Engines for hosting a practice. The team now will advance on to the state competition on April 23 at Wooster.